Em Cena Arte e Cidadania (On Stage: Art and Citizenship) is a Brazilian NGO based in Recife and was founded in 1998 by a group of friends who strongly believed they could make a difference in the world through the arts. The struggle for human rights is rewarded only at the most basic levels, with the majority of the population guaranteed only minimal survival conditions. Meanwhile, formal education and art education are pushed into the background and the real tools one needs to fight for her or his rights (such as the ability to read and write, find strength to face challenges, and so forth) are set aside. This is how Em Cena began. The people who started Em Cena wanted to provide those families and kids who were so used to receiving money from the government, or attending bad schools, with an opportunity to improve their lives through the magic of the arts. This magic is made up of essential ingredients: form, sound, colour, word, movement. The artist’s work enables her or him to dominate, control, and transform experiences into memories, memories into expression, material into form, and elements into works of art. That said, the objectives of Em Cena Arte e Cidadania have evolved over the years. 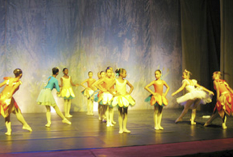 Although Em Cena started as a high quality performing arts school which aims to put children’s time to good use and to keep them off the streets, they have moved to a broader set of objectives and ideals. Although Em Cena’s focus is still on children and teens, they believe it is worthless to work only with the kids and forget the adults who are around. The problems that children face, most of the time, is a consequence of the life of an adult and of the place where they live. Therefore, Em Cena has branched out to other community work – but no one knows the other work that they are doing. Therefore, the main problem that the organisation is facing at the moment is that people within the community don’t know that Em Cena Arte e Cidadania now offers other services that involve the community as a whole. This is the primary objective of the placement. Help get more people involved with Em Cena, so that they can improve even more children’s lives in their local community.